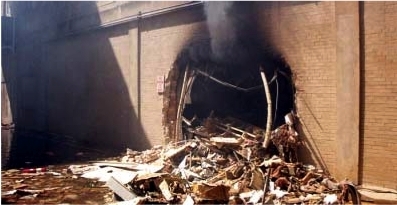 There is little if any hard evidence available to the public, that American Airlines Flight 77, a Boeing 757 flying from Washington Dulles International Airport, crashed into the Pentagon on September 11, 2001. At the Dept. of Defense (DoD) News Briefing on September 12, 2001, American Airlines, Flight 77, Boeing 757, and Dulles were not even mentioned. From my close up inspection there's no evidence of a plane having crashed anywhere near the Pentagon. . . . . The only pieces left that you can see are small enough that you could pick up in your hand. There are no large tail sections, wing sections, fuselage - nothing like that anywhere around which would indicate that the entire plane crashed into the side of the Pentagon. . . . It wasn't till about 45 minutes later . . . that all of the floors collapsed. In response to another question: "Chief, there are small pieces of the plane virtually all over, out over the highway, tiny pieces. Would you say the plane exploded, virtually exploded on impact due to the fuel", Plaugher responded: "You know, I'd rather not comment on that." Victoria Clarke, Assistant Secretary of Defense for Public Affairs - "presenter" of the DoD briefing, did not contradict Chief Plaugher. Evidence that a Boeing 757 struck the Pentagon? stared in disbelief at a smoking gash in the Pentagon . . . But no person or thing emerged from that side of the Pentagon. 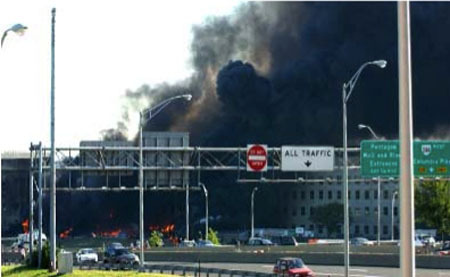 We heard that survivors and injured folks were being recued from the inside, . . . and out the River exit into ambulances. a strange absence of airliner debris, there was no sign of the kind of damage to the Pentagon structure one would expect from the impact of a large airliner. This visible evidence or lack thereof may also have been apparent to the secretary of defense, who in an unfortunate slip of the tongue referred to the aircraft that slammed into the Pentagon as a 'missile'. 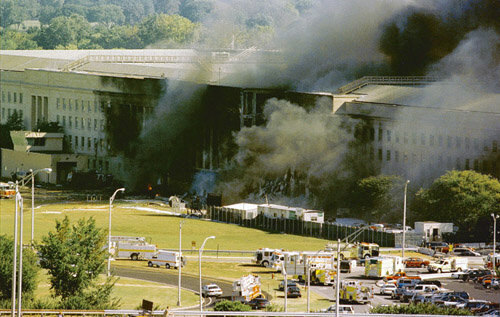 Gen. Larry Arnold, revealed that he ordered one of his jets to fly down low over the Pentagon shortly after the attack that morning, and that his pilot reported back that there was no evidence that a plane had hit the building. Publicly available photos support these statements by Jamie McIntyre, Ed Plaugher, Karen Kwiatkowski, and Barbara Honegger. 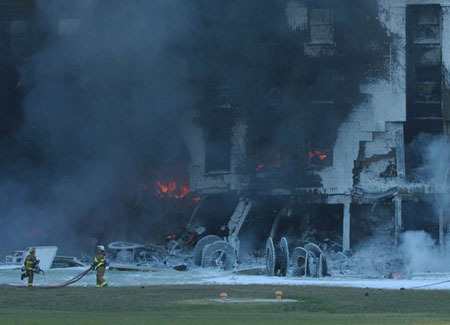 Questions about what hit the Pentagon on September 11, continued to be raised at the Dept. of Defense News Briefing on September 15, 2001. One thing that's confusing - if it came in the way you described, at an angle, why then are not the wings outside? I mean, the wings would have shorn off. The tail would have shorn off. And yet there's apparently no evidence of the aircraft outside the E ring. The hole in the Pentagon wall - prior to the collapse of the roof - appears much too small to accomodate a Boeing 757. If only the front end penetrated the Pentagon, then the wings, a portion of the fuselage, and tail would have remained outside. But no large debris - anything resembling the Boeing 757 wings, fuselage, or tail - is visible on the Pentagon lawn, and the lawn itself shows no sign that a Boeing 757 skidded across it or struck it. 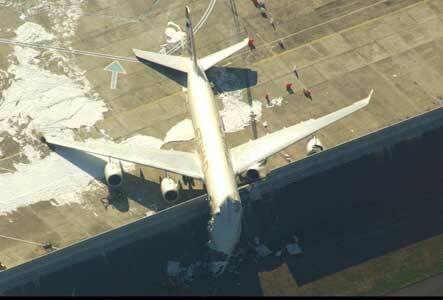 The engines of the Boeing 757 would have survived the impact and heat. 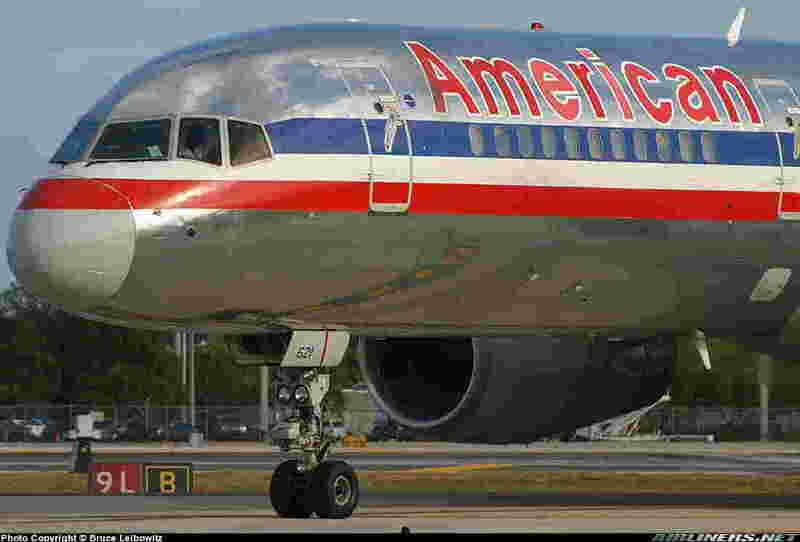 An engine from a plane that struck the World Trade Center was shown on network television, and so was an engine from American Airlines Flight 587 which crashed shortly after takeoff from New York on November 12, 2001. One photo from the Pentagon crash site shows what could be an engine part about 30 inches in diameter outside the Pentagon. Another photo shows what could be an engine part (its size is difficult to determine) inside the Pentagon. 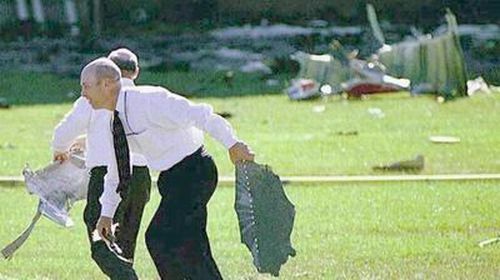 Were these parts, and another piece of debris on the Pentagon lawn traced to Flight 77? According to George Nelson, Colonel, USAF (ret. 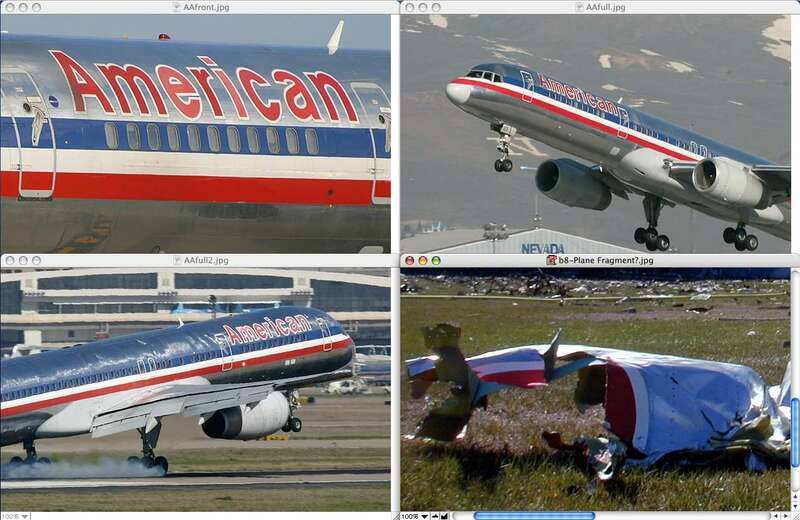 ), serial numbers on aircraft parts could confirm the plane's identity. But the FBI has refused to make that evidence available to the public. Plaugher responded: "I'd rather not comment on that." How did "small pieces of the plane" end up "out over the highway" when the plane is reported to have disintegrated inside the Pentagon after it crossed the highway? If it disintegrated outside the Pentagon why is there nothing that looks like a Boeing 757 on the Pentagon lawn? 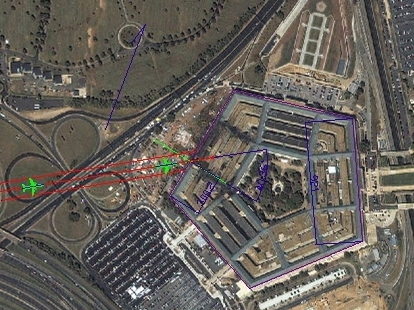 If it disintegrated either inside or outside the Pentagon what caused the hole in C-ring? What made this hole in C-ring? When asked, "Have you removed the bodies?" Chief Plaugher replied, "We have no information on any type of casualty or body counts at this time." National news media, particularly Jamie McIntyre, failed to follow up on Chief Plaugher's comment that "there's no fuselage sections and that sort of thing" when dozens of onlookers, relatives, and firefighters were interviewed on network television about the planes that crashed into the World Trade Center. Photos and videos of the Pentagon reveal yet more curious sights: a trailer, light poles, and a highway sign in front of the damaged area still intact after a Boeing 757 is alleged to have flown through there; office furniture and a computer monitor which survived the fire that is alleged to have vaporized the Boeing 757, but left human bodies in good enough condition to be indentified; two men in white shirts and ties rushing to pick up pieces of whatever struck the Pentagon; "50 FBI officers" walking "shoulder-to-shoulder across the south grounds of the Pentagon, picking up debris and stuffing it into brown bags." These FBI officers did not follow standard NTSB procedures. This NTSB checklist is designed to lead investigators through the steps required for a major aircraft accident investigation. The Pentagon crash may be the only commercial airline crash in modern history in which most of the available evidence has been withheld from the public. What is available looks remarkably different from other crash sites. Reporters on the scene were denied access, and "handcuffed and dragged away". Many eyewitnesses reported seeing a large plane hit the Pentagon. Others reported seeing a commuter plane (Could this have been a cruise missile?). However, their accounts are contradicted by more credible witnesses -- CNN's Jamie McIntyre, Fire Chief Plaugher, and Col. Kwiatowski. Then there's the May 23, 2003 testimony of Norman Y. Mineta, Former Secretary of Transportation, that Vice President Richard B. Cheney may have given a do not shoot order to facilitate an attack on the Pentagon. There was a young man who had come in and said to the vice president, "The plane is 50 miles out. The plane is 30 miles out." And when it got down to, "The plane is 10 miles out," the young man also said to the vice president, "Do the orders still stand?" And the vice president turned and whipped his neck around and said, "Of course the orders still stand. Have you heard anything to the contrary?" Five video frames initially released by the Pentagon raised more questions than they answered - no Boeing 757 was visible. 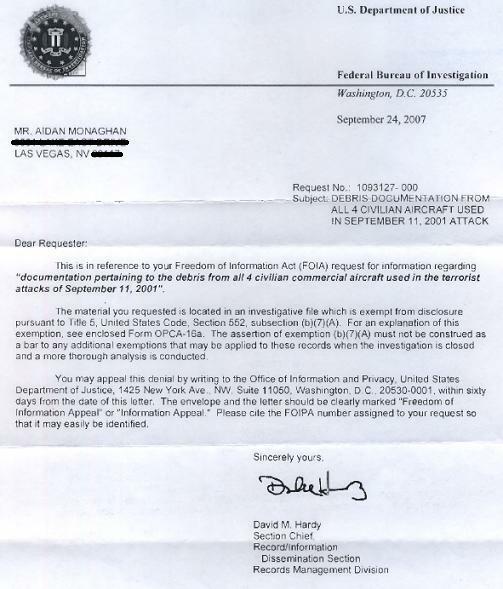 Videos released on May 16, 2006, pursuant to a Freedom of Information Act request by Judicial Watch, are as inconclusive as the first five frames. Further doubt has been cast on the official account of Flight 77 by Pilots for 9/11 Truth. They claim that "video captured by the parking gate cam is in direct conflict with the Aircraft Flight Data Recorder data released by the NTSB." The 9/11 Commission Report animation (July 2004) shows an aircraft flying south of the Navy Annex. The video captured by Pentagon security cameras shows an object flying level before striking the Pentagon. The NTSB animation (January 2002), according to the pilots' organization, shows an aircraft flying north of the Navy Annex, not levelling off, and being too high to have hit the Pentagon. The Citizen Investigation Team has tracked down credible eyewitnesses, and some remarkable photos, that corroborate the findings of Pilots for 9/11 Truth, and undermine the official explanation. And there are unresolved issues regarding the complex maneuver executed by the alleged pilot of Flight 77, and the identities of the alleged hijackers. Radar shows Flight 77 did a downward spiral, turning almost a complete circle and dropping the last 7,000 feet in two-and-a-half minutes. The steep turn was so smooth, the sources say, it's clear there was no fight for control going on. And the complex maneuver suggests the hijackers had better flying skills than many investigators first believed. The jetliner disappeared from radar at 9:37 and less than a minute later it clipped the tops of street lights and plowed into the Pentagon at 460 mph [sic]. The New York Times reported that Hani Hanjour "could not fly at all." His reported lack of flying skills makes it highly unlikely that he could fly a Boeing 757 in a spiral turn from 7000 feet, over a communications tower on the downslope south of the Navy Annex, over a highway sign on Route 27, over light poles on the off ramp, level off at an estimated 350 mph [sic] in the remaining 150 yards - "the top of the fuselage of the aircraft no more than 20 ft above the ground" (Pentagon Building Performance Report, p14), and strike the first floor of the 5-story, 71 feet tall Pentagon. The names of the alleged hijackers do not appear on Associated Press' September 17, 2001 "partial list of victims" on the hijacked flights. Hani Hanjour's "name was not on the American Airlines manifest for the flight because he may not have had a ticket" reported the Washington Post. At the Zacarias Moussaoui trial in July of 2006 the prosecution presented new passenger lists. On September 23, 2001 the BBC reported that four of the hijack "suspects" - Waleed Al Shehri, Abdulaziz Al Omari, Saeed Alghamdi, and possibly Khalid Al Midhar were - alive, and that FBI Director Robert Mueller acknowledged "that the identity of several of the suicide hijackers is in doubt." The FBI's "Most Wanted Terrorists" web page does not state that Bin Laden was responsible for the attacks on September 11. In our investigation, we have not uncovered a single piece of paper - either here in the United States, or in the treasure trove of information that has turned up in Afghanistan and elsewhere - that mentioned any aspect of the September 11 plot. Just prior to September 11, 2001, a congressional committee was investigating unaccounted funds at the DoD. The section of the Pentagon destroyed is said to have housed records of DoD spending and the personnel for monitoring that spending. After September 11, 2001 about 5,000 foreign nationals were detained, and denied basic constitutional rights, in the name of "wartime" expediency. On March 4, 2004, a German court "overturned the world's only conviction" in connection with the September 11 attack on America "because the U.S. withheld crucial evidence.